A woman and her mother are currently battling for their lives in a hospital, following an alleged machete attack by her husband in the Ikpoba-Okha Local Government Area of the state. Southern City News gathered that the incident occurred on Ikpoba Hill, Benin, the state capital. It was gathered that the suspect, identified as Iyen Igiebor, was repatriated after an unsuccessful sojourn abroad. He was said to have moved into his in-law’s residence on Ikpoba Hill after failing to secure an accommodation of his own. It was learnt that an argument had ensued between the couple, following the alleged refusal of the wife to accompany him to a place where the suspect claimed to have found an apartment for rent. The disagreement was said to have resulted in a separation between the two. It was, however, gathered that tragedy struck when Igiebor later attacked the wife with a machete while on her way from a market. A source said the suspect had attempted to sever the head of his wife but left her with a deep cut in her arm. The mother-in-law was also said to have sustained a cut in the head and face. It was learnt the cries of the women attracted the attention of some neighbours who came to their rescue. 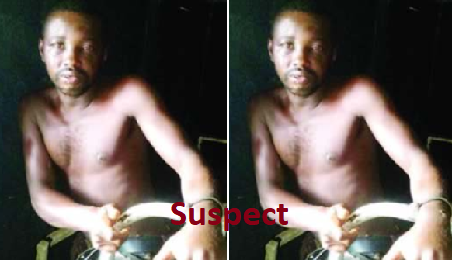 He (suspect) had been reportedly arrested by the operatives of the Aduwawa Police Station. The source said, “He asked the wife to follow him to a place to go and rent a place (apartment), but the woman said that she could not go to the area. “The man asked why and they started fighting before the woman left. They have not seen each other for over two weeks and only he has been living in that place. “The woman and the mother were coming back from the market at night, at about 9pm and did not know that the man was waiting for them.